What's the old saying? Don't help someone when they're down? Only kick a person when they're already down? Something like that. At least, airlines pretty sure they misheard that saying right. They're trolling United Airlines very hard right now. 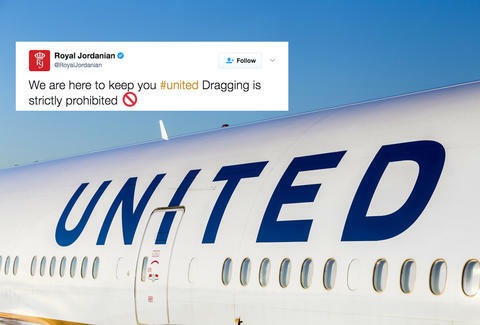 United is in the midst of a full-on PR disaster after a man was forcibly removed from a flight and bloodied over the weekend. The airline compounded the problem by issuing a couple sorry-not-sorry apologies before a more sincere apology arrived Tuesday, after the airline's stock started to tank. Like basically everyone on Twitter, other airlines have seen United in a moment of weakness and decided to kick them in the ribs while the getting is good. Emirates and Royal Jordanian have taken a page from Delta's playbook. Delta sniped at United last month after United was involved in a separate controversy involving an employee who wouldn't allow passengers on a plane because they were wearing leggings. A troll-job from Southwest Airlines has also been making the rounds on Twitter, but that was never tweeted out by Southwest and there's no evidence it originated with the airline. Other airlines may have laid off because what goes around comes around. Though most airlines don't have blemishes like this, most are a long way from having a perfect track record.